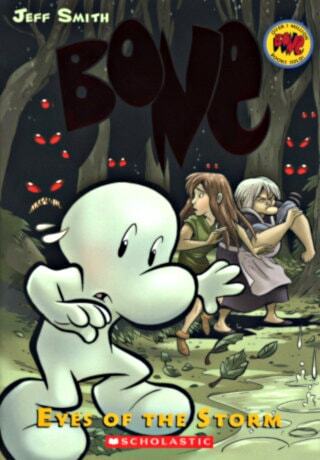 The story of Bone 3: Eyes of the Storm graphic novel picks up what is left by the 2nd book, The Great Cow Race. After all the destruction and chaos done by Rat Creatures army, the Bone cousins and Lucius are helping out Granma Ben and Thorn to rebuild their house and farm. Thorn and Fone Bone is starting to have weird dreams in her sleep. And this dream will lead them in unveiling a big secret about Thorn and Granma Ben. The dynamic duo of Phoney and Smiley Bone have to return to Barrelhaven Town because both them have lost a huge bet against Lucius and have to work for him in the Lucius’ tavern to pay their debt. However, they are ambushed by the Rat Creatures who desperately want to capture Phoney Bone. Meanwhile, in the town another threat is waiting for the Bone cousins. The town people are angry for being conned by Phoney Bone in the Great Cow Race and they are ready to tear the Bone cousins apart. In “Eyes of the Storm,” volume three of the nine-book BONE saga, Lucius, Smiley, and Phoney survive an attack by the rat creatures and return safely to Lucius’ tavern in Barrelhaven. Phoney, desperate to win a bet with Lucius, stokes the townspeople’s fear of dragons and boasts that he is a professional dragonslayer.Back at the farm, Fone Bone and Thorn are troubled by strange dreams, and Gran’ma Ben’s reaction to them is stranger still: She reveals long-kept secrets and warns of great danger. Thorn, Fone Bone, and Gran’ma Ben may have to leave the farm forever.